Remember the 1950’s blonde table my Aunt wanted me to paint? Well I painted it and delivered the table last week on one of my Arkansas visits. I think it turned out great and my Aunt seemed very pleased with it. We did a good job of selecting a paint color to match the chairs. This is the table. It has the original blond finish typical of the 1950’s and my Aunt and Uncle have owned the table since shortly after they were married. My aunt was using the table in her den but had it covered with a table cloth because the top had some veneer damage. The color is Lost Atlantis from Valspar. I knew it wouldn’t take much paint for the table top so I had the paint mixed in a sample size of Behr Ultra in Satin. 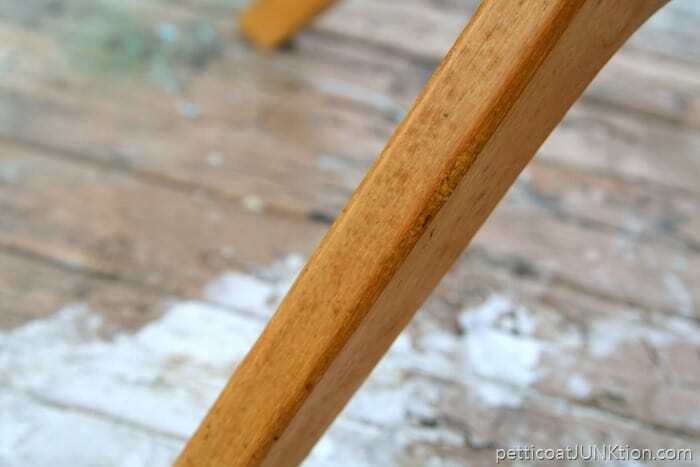 The reason for painting the table top is because the veneer was crackled and slightly rippled. I sanded the top by hand with 100 grit sandpaper. The finish was discolored in places and had a few dark “age” spots. Some of the spots were easy to remove and some were stubborn and are still there. I used Simple Green to remove the “age” spots and then applied a coat of Howard’s Wax in Golden Oak to pep up the finish. For the top I applied two coats of Glidden Gripper tinted gray. There was one area where a bit of the veneer was loose and a little wood glue took care of that. Now you guys know I’ve talked about changing plans mid stream and you know I’ve done it countless times. This is one of those times. Don’t feel bad if it happens to you too. That’s just the way it goes. 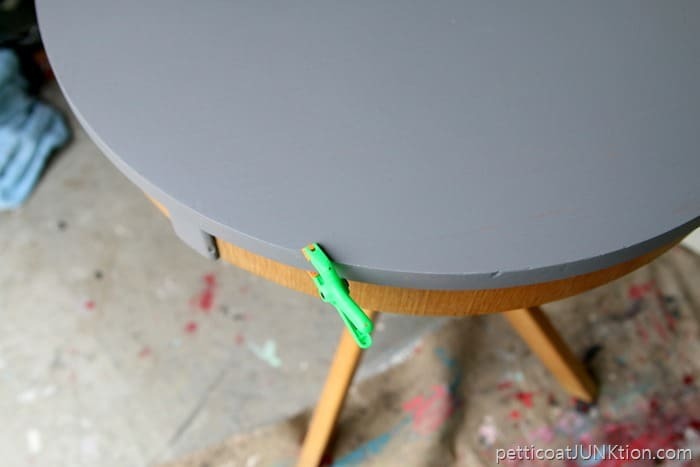 My Aunt and I talked about painting the raised wood pieces on the side of the table a pale green. I thought that would be a nice compliment to the blond finish and also pull another color from the chairs. Well, I painted the details and kept looking at them thinking I really didn’t care for it. What did I finally do? I texted a photo to my sister. This is what she said “Not a fan, sorry”. I got out the Simple Green again and some 220 grit sandpaper and slowly and gently removed the paint from the four raised wood details (two on the back side). It took a few hours. But I was much happier. I also changed out the turquoise knob I first chose for the project and went with the glass and gold knob from Hobby Lobby. And that’s it! Have you worked on a project only to have it turn out wrong…..or not what you envisioned. If you keep asking yourself if you like it….there’s a problem. Make changes until you can look at the project and it brings a smile to your face. That’s all from me. 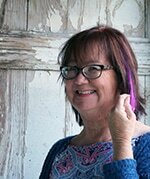 Leave me a comment and let me know what you think of the table.To read all of my Arkansas/Alzheimer’s Stories start by clicking here…Arkansas Stories. I’ll see you tomorrow. That looks beautiful! 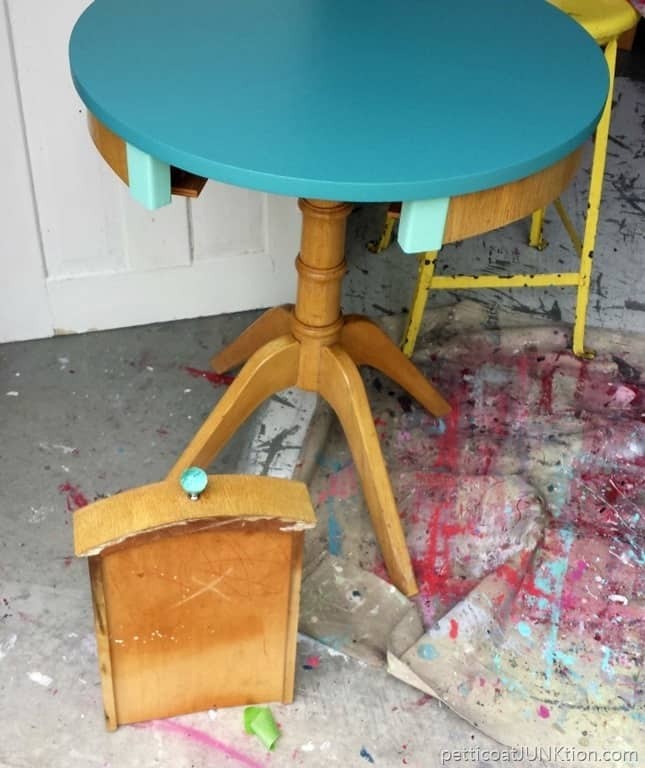 You have inspired me to do this to an antique table of mine that need’s some love! Thank you! Table turns old to brand. hey you brilliant. This table is suitable for any room. Those chairs makes this table perfect. Color sense is more better then any experts. Color selection is perfect and you did a great job on the repairs. I hope your aunt surprised looking this Table. Really Gorgeous ! Love the color choice! 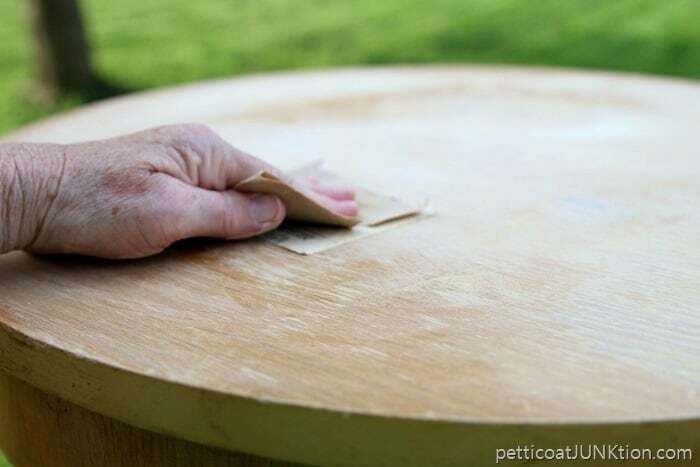 When applying the color to table top, did you brush it on, roll it on or spray it on? From the pic it looks extremely smooth on the finish. Also did you apply a polyeyrethene top coat? 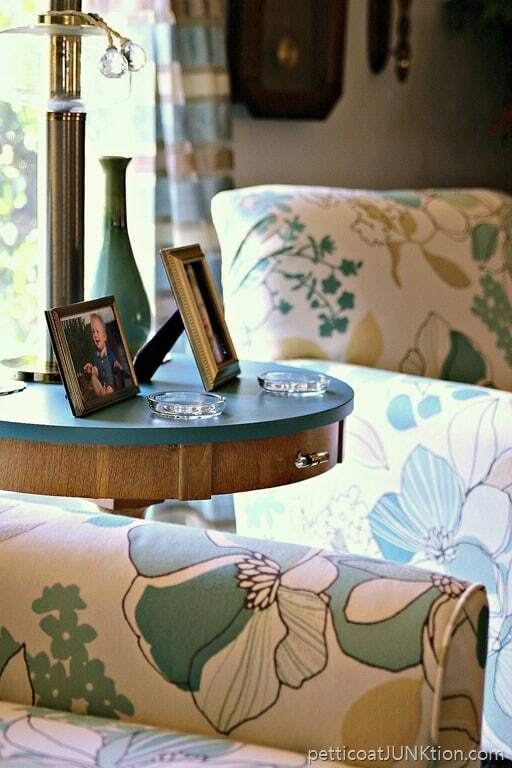 Love this table! Color selection is perfect and you did a great job on the repairs. Another gorgeous rehab. Nice job. Gorgeous! I commend you on your patience to change color midstream! It coordinates quite well with her upholstery. Nice job. Thanks for sharing. Well I just love this! The color is fresh and beautiful, it looks fab against the blonde wood – you nailed the drawer pull too! 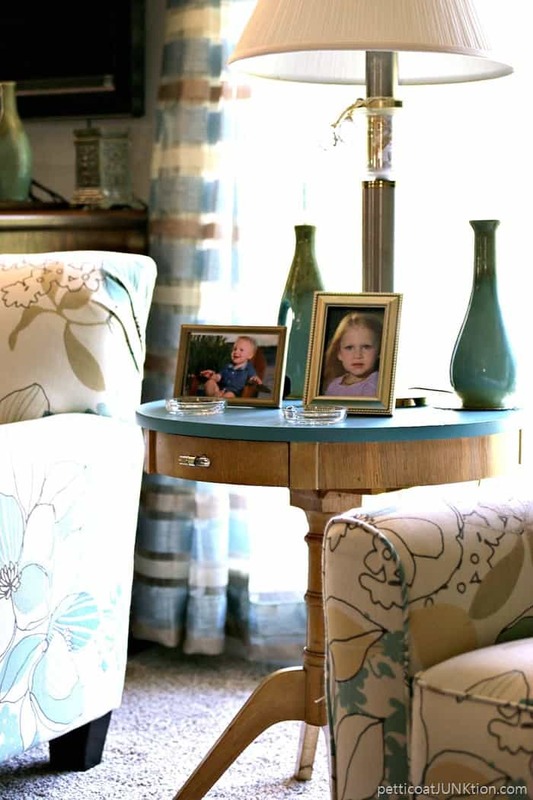 That table turned out so pretty and the color for the top that you picked out really does complement your aunt’s chairs. 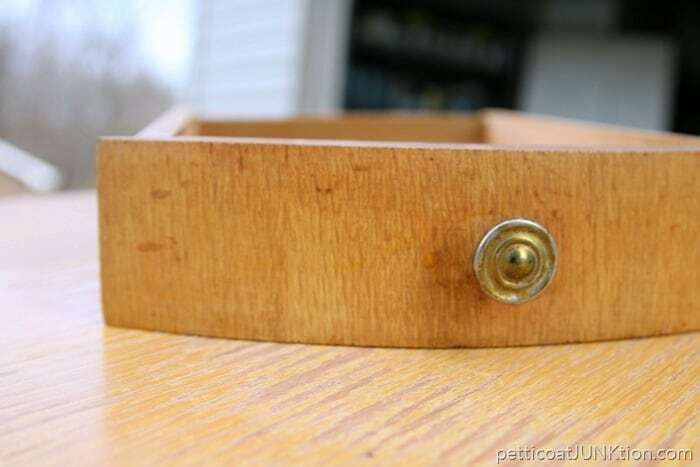 I really like the drawer handle from Hobby Lobby also. I think it’s so sweet that you redid the table for her. Love the table. Good call on taking off the secondary paint and changing out the knob. You do such fine work. Keep it hummin’. 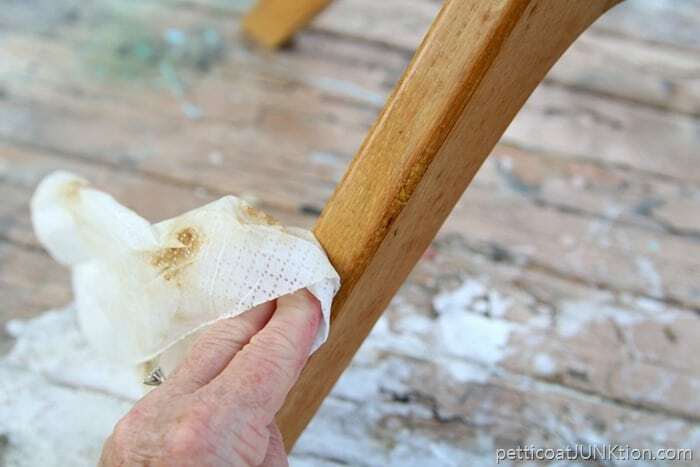 Did you use the wax on the table top, also? It looks great! I definitely prefer the new look! Love the color for the top. Did you paint the inside of drawer the same color? Very nice. Perfect choice for the drawer pull. Also agree removing the paint from the raised blocks on the skirt was the right thing to do. I think it turned out very nice. Now she doesn’t have to cover it up anymore. 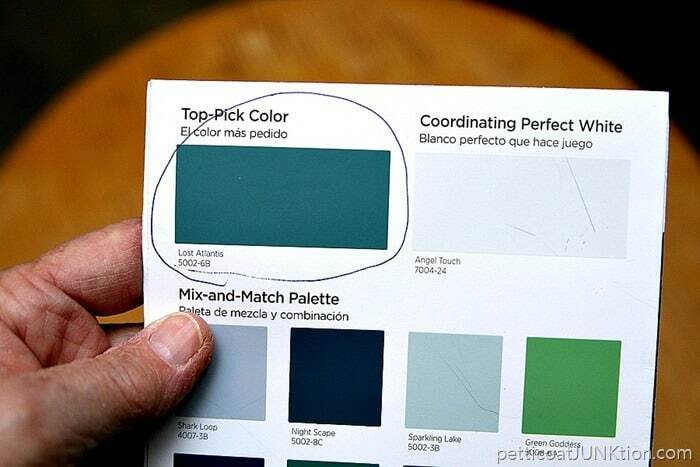 Love the table and the color you picked is great! Just a thought, for the times you are not sure….cut a note card the size of the accent wood piece, paint and tape in place. It will save you a ton of time if you don’t like it. 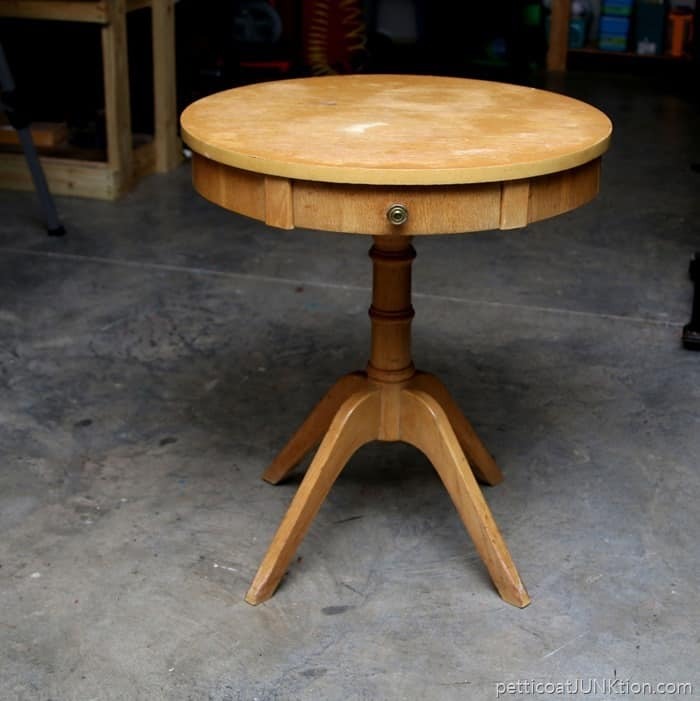 We have a table exactly like this one! It was my mother-in-law’s. Thanks for the idea! Looks great! 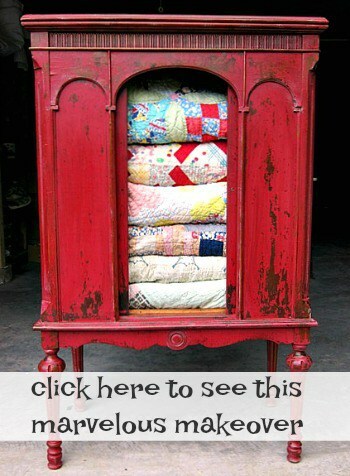 I might do something similar as I have a blond hope chest that belonged to our mother. Always wanted to do something with it. Oh and to answer your question, oh my YES! I recently tried to install tin tiles for a kitchen backsplash and using the adhesive the directions recommended. Did not work and I spent about 4 hours trying to get them to stick. I finally just went with nailing them up and the application was done in 30 minutes. The table looks great with those gorgeous chairs! Just that pop of color to bring it back to life. Your aunt must be thrilled. I love your passion and enthusiasm for the projects you create. The table looks great, so fresh and pretty! 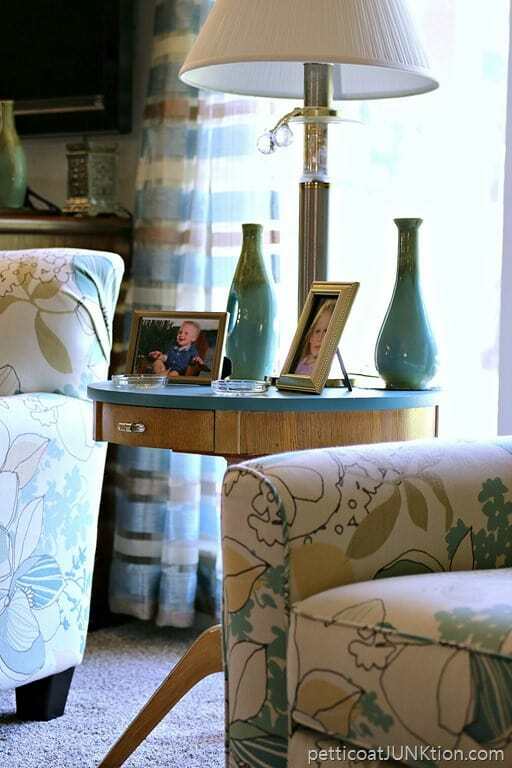 She looks great with your Aunt’s chairs, you chose a perfect color! I want that table! I love it. I’m a big fan of blue, so the color suits me just fine. Looks great next to the chairs. Good Job!! It looks wonderful! Good job on painting it. That table looks better than new…nice color choice.